Water Heater Repair & Installations - Authentic Custom Services Inc. Restore Your Hot Water Today & Never Worry Again With Our Guarantee. If you are experiencing any of the following problems, you should have the water heater inspected by a trained plumber. 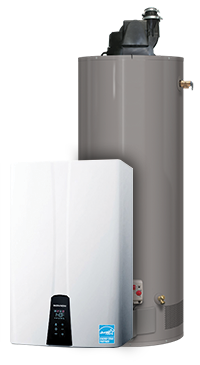 The average life span of a water heater is between 8 and 12 years. When it comes time to replace yours, chances are, you’ll pick the same type of unit — either gas or electric. The key is picking the most efficient water heater large enough to handle your needs. An average family of four with two showers will use a 65 gallon unit, but the experts at your local home center can help you come up with the best size. Also, make sure you check the annual cost of operation for the unit. This should be listed on the sticker on the side of the heater. Get Hot Water Back In Your Home And Never Worry About It Again With Our Attached Maintenance Plan. The Importance of Maintenance – Membership 159.00 per year. We recommend a yearly draining of your water heater to ensure long life and proper performance. Without it scale and sediment build up and cause the water heater to under perform or fail; consequently, all of your laundry, dishes in the dishwasher, your baths or showers, are tainted with this scale and sediment. Our plumbing maintenance program, available to ACS Club members, includes an annual “draining” of the tank which prevents sediment and other buildup that will cost you more in energy use over time and shorten the life of your water heater. This also includes inspection of the anode rod, which is a metal rod inside the tank that sacrifices itself to save your tank. Instead of your tank rusting out, your anode rod deteriorates due to an electrolytic process. Many Tampa home and business owners save money on water heater repairs with their ACS Club membership. 1. Old Water Heater – How old is your water heater? Generally, most water heaters that are more than 10 years old should be considered for replacement. You can find the age of your water heater by looking for the serial number on the manufacturer’s sticker on the upper portion of the water heater. The serial number contains the date that the water heater was manufactured. The manufactured date is not normally written. Instead, the serial number will have a date code such as “F051052638”. F is for the month and F is the sixth letter in the alphabet, so it represents the sixth month, June. Next, the first two digits of the serial number are 05, which represents the year, 2005. So this water heater was made in June 2005. Each manufacturer has a similar date code, and they can vary. 2. Stationed – Is your water heater stationed in a safe place to avoid significant damage? Your water heater surroundings must be all considered when replacing or upgrading it. It’s vitally important that its away from areas where it will cause significant damage or have extra protection if it does fail. You should strongly consider replacing it after 10 years (or before, if any of the following symptoms occur). Yes it’s time to replace your water heater if you notice rusty water, because the inside is rusting away and it may begin to leak soon. Your water hheater can also be connected to galvanized piping, you may have rusty pipes. A good test to avoid replacing a functioning water heater is to drain a few five-gallon buckets of hot water out of the water heater. By the third bucket, if the water from your heater is still coming out rusty, then most likely the water heater (not the piping) is at fault. Water heaters build up sediment on the bottom of the tank. This sediment goes through some temperature changes as the water heater cools and heats up. This sediment hardens up as a rock over time. Once the sediment hardens the water heater starts to make sounds rumbling, banging, clinking sounds. It’s time for a new water heater. This means less efficiency requiring more energy from the water heater to control the water temperature. Along with less efficiency comes small leaks, rusty water, and smelly water. Noticing a pool of water around your water heater can be a sign of a small leak in the tank. However before you replace your water heater make sure the leaks are not coming from fittings, connections, or your temperature/pressure overflow pipe. To check this make sure all connections areas are dry. Hot water heaters are complicated pieces of equipment. They should only be installed by professional, fully-licensed plumbers, like those at Authentic Custom Services Inc. Plumbing the Tampa water heater installation and repair experts. There are horror stories of homeowners trying to fix or replace their own water heaters that have required re-piping to correct. Dangers come with doing this yourself, including shock, gas leaks, serious water damage, carbon monoxide poisoning, and explosions. Don’t take chances… call us when you have any problem with a water heater. If you need help doing a complete water heater inspection contact us to determine if you need a new water heater. Call us today at (813) 473-2271 to schedule your service call.